Perhaps it is fitting during this week when the 100th anniversary of the Armenian genocide is being commemorated, that we note the recent words of Russian President Vladimir Putin. In a film celebrating his 15 years in power (finally the pretense of his swapping the post of Presidency with his aide Medvedev for that of prime minister in order to circumvent the term limits on the Presidency has been cast aside), Mr. Putin yesterday stated, "It's not because Crimea has a strategic importance in the Black Sea region. It's because this has elements of historical justice. I believe we did the right thing and I don't regret anything,"
What historic injustice did Putin put right in the annexation of the Crimean peninsula? Depending on how far back one wishes to go, we might consider the three centuries of rule under the Ottoman empire in the 15th to 18th centuries, followed by Tsarist Russia annexing it in 1783. Soon after the Bolshevik revolution of 1917 was finally secured, it declared the peninsula a Crimean Autonomous Soviet Socialist Republic. In 1945 it became a Soviet oblast (province), and in 1954 was ceded to Ukraine. Those elusive and fleeting years when Russia and the Ukraine were ostensibly equal allies, the Russians maintained a Black Sea fleet based in the port capital of Sevastopol, Crimea, and Black Sea resorts allowed Russian and Soviet elite a respite at a warm ice-free setting for their holidays. As the USSR collapsed in the early 1990s, the Crimean peninsula remained part of Ukraine until the latest upheaval in 2014 when Ukraine began to lean towards the West. Judging the West as lacking in resolve, Mr Putin and his green little men took over the peninsula and declared it part of Mother Russia once again and now we are up to date. Teatree assumes it was the unilateral decision by the Soviet politboro of 1954 to give the land to Ukraine that Mr Putin refers to as an historic injustice, though there are other possibilities. One of the historic ethnic groups living on the Crimean peninsula were Muslim Tatars, comprising up to 25% of the population. After the Crimean War of 1853-1856 between the Tsarist Russia and Western powers fighting over the weakening Ottoman Empire,the tatars had to flee en masse to avoid persecution by the Russian victors who had ultimately maintained control. During the Bolshevik revolution of 1917-21 which devolved into a multi-year Russian civil war, the peninsula and its population was ravaged by multiple factions. The tatars who had filtered back to their native lands were ravaged once again in the 1930s by Soviet leader Stalin, who also introduced large numbers of Slavs into the region. In another irony, from 1923 into the second world war, there were efforts to move Soviet Jewry into the land, with one soviet functionary, Vyacheslav Molotov, even suggesting the idea of establishing a Jewish homeland. From a posting at the worldjewishlibrary, we read, "The Crimean peninsula was, for decades, a potential Jewish homeland. After Catherine the Great conquered Crimea from the Ottomons in 1783, she encouraged Jewish settlement to the region. In the following century, tens of thousands of predominantly young Jews moved to this part of "New Russia." By the late 1800s, Crimea had become a thriving training center for future Zionist pioneers who used the land to test agricultural techniques before they relocated to Palestine. In fact, Joseph Trumpeldor once trained potential migrants in the Crimea. The Soviet Politburo was even behind the idea and accepted a proposal to establish a Jewish Autonomous Region in the Crimea in 1923, though it later reversed the decision. Even so, from 1924 until 1938, the Joint Distribution Committee - through the American Jewish Joint Agricultural Corporation and its American Jewish financiers - supported Jewish agricultural settlements in Soviet Crimea." At any rate, World War II brought savage fighting to the peninsula between German and Russian forces. Germany wanted the land for its strategic value and its warmer agricultural climate, and occupied it for nearly three years. Jews here, as well as in Ukraine were targeted for annihilation during that time. The Soviet army recaptured the capital city, Sevastopol, in 1944, and Stalin immediately ordered the entire population of Crimean Tatars forcibly deported to Central Asia as collective punishment for allegedly collaborating with the Nazis. Only late in the Soviet empire's existence were the tatars politically rehabilitated and allowed to return to what was now an ethnically slavic region with Ukrainian and Russian populations. 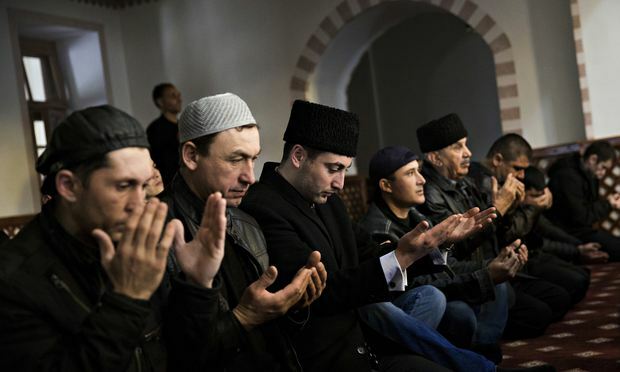 In 2014, with Russian forces suddenly in charge once again on the peninsula, the tatars who had returned or remained were facing a dispiriting, though not unfamiliar dilemma. Embrace Russia or leave your homeland. An al-jazeera article captures the new plight in detail, found here. So on we go - the number of historic injustices are plentiful, many have been inadequately addressed, and many ignored. And Putin, like other strongmen of the past, has chosen to pick a particular slight but primarily to further his own power and influence.